As the General Election campaign has begun, one usually only nominally right-wing propaganda source has been swung firmly behind the Tories: to no surprise at all, the perpetually thirsty Paul Staines and his rabble at the Guido Fawkes blog have turned their alleged “brand” into a thinly disguised shill for The Blue Team, to the extent that they have put out eight Labour-bashing items already today. 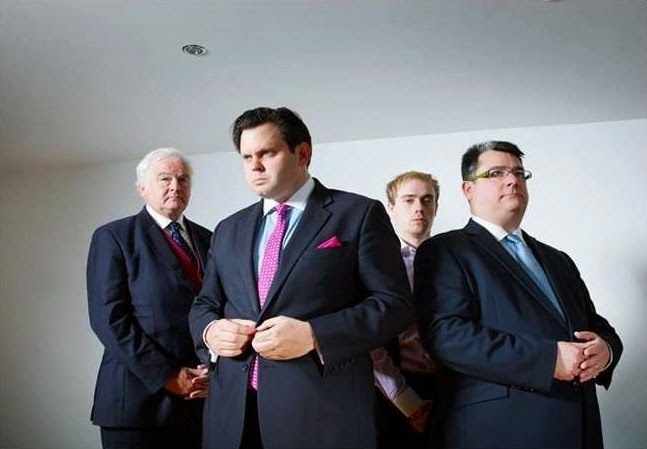 Sadly, the slant is obvious from the word go, but when Staines has to depend on the likes of the odious flannelled fool Henry Cole, and newly anointed teaboy Alex Wickham, items suggesting Labour supporters are all on benefits, from a sample of one, are all too predictable. Then they use a Green Party mug to claim that Labour Party mugs are rubbish, because, well, it’s Phil Space journalism, innit? Then there is an opportunity to bash Pa Broon. Ah, it must seem like The Good Old Days for Staines: the personal abuse, the claims of unsuitability for office from someone who celebrated Brown’s period at 10 Downing Street by narrowly escaping a custodial sentence for drink-driving. “You could not make it up. Despite no longer being an MP, Gordon is back and making outlandish spending claims in Scotland”. Got a credible source for that “outlandish” assertion? No, thought not. Ah, but then comes “Labour Campaign Chief Breaks Social Media Election Law”. Lucy Powell may have been late amending her Twitter bio. So why not be even handed and castigate Young Dave for using his address in front of Number 10 earlier to channel Harold Wilson and use it to attack his main opponent? We won’t be going there, Paul, will we? But hey ho, another hour, another propaganda item: Labour’s FT advert today gets a kicking, with the priceless line “Guido hears that Kellogg’s are pretty frosty about it all too”. No citation. No surprise. No change there, then. Could there be more after lunch? There certainly could: Andy Slaughter is accused of distributing election literature today claiming to still be an MP. We don’t get a verifiable citation for that one, either. And then comes the Pièce de Résistance, as Labour’s new advert, featuring Martin Freeman, gets trashed on the grounds of his “Tax Dodge Shame”. Did he dodge any tax? Well, no actually: the suggestion is that he was somehow responsible for his partner’s tax bill. The Guido Fawkes and Alex Wickham Twitter accounts even refer to Freeman’s partner as “his wife”. They aren’t married. Accurate as ever, eh lads? Oh, and Guido has also been “hearing” that there has been some kind of meeting between Alan Johnson and ATOS, although, as ever, you have to take that on trust, which here on Zelo Street we won’t be doing, thanks. 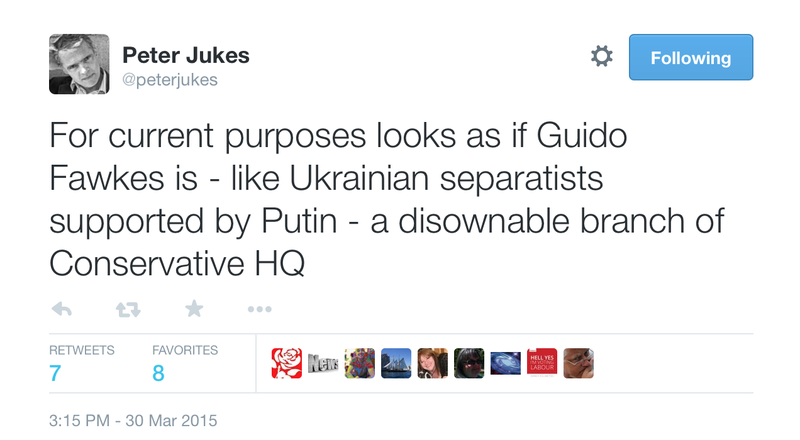 As Peter Jukes has observed, “For current purposes looks as if Guido Fawkes is - like Ukrainian separatists supported by Putin - a disownable branch of Conservative HQ”. It would be terribly sad to lose one’s editorial control. Which the Fawkes rabble have, of course, not done. Anyone suggesting otherwise may get another of those legal threats. [UPDATE 1910 hours: the Fawkes rabble even failed to get their Martin Freeman story straight, it seems. Amanda Abbington, whose tax bill was the basis for their snark at Freeman, paid the debt off last year. As the Mail On Sunday diary reported last March, "Amanda Abbington, the long-term partner of The Hobbit star Martin Freeman, has finally paid off her £120,000 debts ... after landing lucrative roles in ITV series Mr Selfridge and in Martin’s hit TV drama Sherlock, she is back in the black". So no tax dodging took place at all! 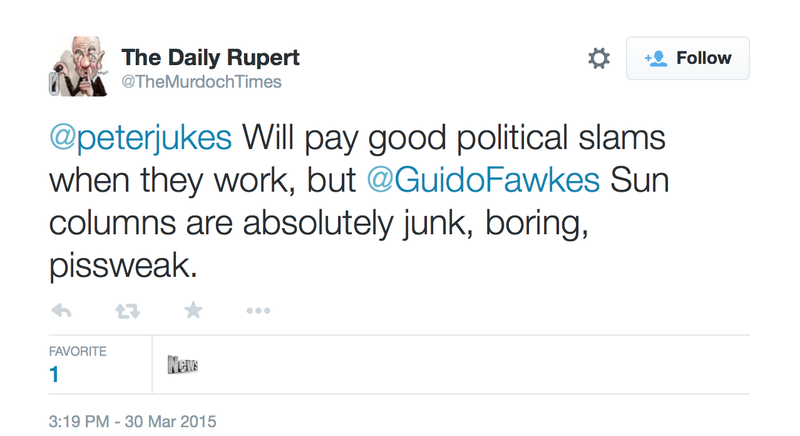 No doubt The Great Guido will be making amends to that post in short order. I mean, accuracy and all that, eh, chaps? Not for nothing have I been calling Guido Fawked "Tory Boy" for the dual reasons that he not only looks like Harry Enfield's creation, he sounds like him as well. Didn't Paul Staines transfer his VW Golf over to his wife to avoid it being impounded & crushed following one too many drink driving incidents? Tim a few years ago Guido declared himself bankrupt so why on hearth his wife didn't come to the rescue. If it's good for Martin Freeman to help her long term partner that sounds good as well for Guido's wife. Double standard as usual with this guy. I'm not sure that Staines had married at the time he declared himself bankrupt - any information on that front would, of course, be welcome.